This gloomy weather we’ve been experiencing the past weeks just makes me a little sentimental. I try to avoid fast food as much as possible, but there are those times that I give in to my cravings. Tropical Hut Hamburger is my first love when it comes to Pinoy fast food. I still remember the branch at the corner of Edsa and Ortigas, as well as the one just outside my Aunt’s village in Sucat. Both of them were supermarkets with an eatery. The ones I’ve seen that still exists are in BF Paranaque and Pioneer corner Shaw. I am very happy to see that the Pioneer branch is open 24 hours so I’ve visited this branch a few times since last year, and even happier that the Classic Cheeseburger still tastes like my childhood. I love the combination of the soft bun, light mayo, the juicy patty topped with a slice of pickle and tomato, and a few lettuce leaves. I’m trying to recall which local food chain was rumored to include worms in their patties but it never stopped me from eating them. 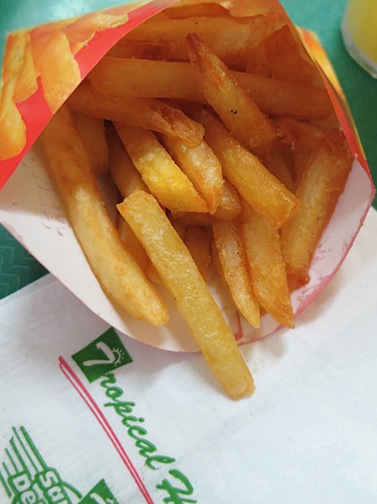 The only downside for me are the fries, they are no longer hand cut potatoes. I miss that unperfect feel of real potatoes, a cross between a crisp and soggy fry. Instead, the fries are probably commercial bought that’s frozen and ready to cook. Another time, I visited the Greenhills branch to get my fix but only to get a disappointed that they appear to scrimp on their portions. Since then, I’ve only been to the Pioneer branch because they’ve been very consistent in all my visits. What’s your favorite local fast food chain? Pioneer St. cor Shaw Blvd. Funny enough I always end up ordering the chicken sandwich when i'm at Tropical Hut. I could prob make it at home but theirs also tastes home-made, toasted sliced bread and all. I love Tropical Hut! 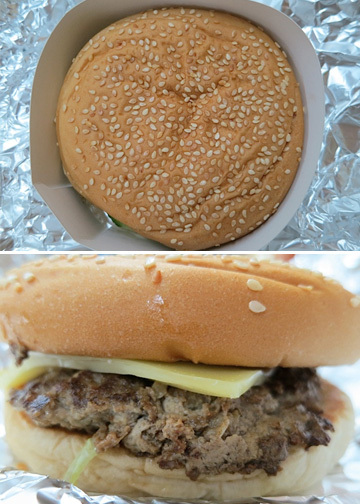 Their burgers manage to stay beefy (versus a mass produced cardboardy flavor of most fast food chains). My personal faves are the Rancho Ranchero (topped with a sunny side up egg) and the Hawaiian Glee (topped with a pineapple slice) Strangely, I am addicted to the quick fried beef and their macaroni salad :) Its ultimate comfort food for me! I concur~ and TH also has DA BEST FRIED CHICKEN among all the fast food joints, at par with KFC, and so much better than Jollibee or McDo. Free extra rice pa : ) Tropical Hut's as good as tasty and as crispy as Pancake House's Pan Chicken! Hi Kate, I remember eating in the TH branch in the corner of pasay rd and pasong tamo during my HS days. My favorites were the burger of course and the spaghetti. Your post made me want to head out and grab a TH burger again. Sometimes we forget about places like these with the proliferation of choices that we have. It is posts like yours that make us remember. Thank you for this. Thank you all for sharing your Tropical Hut favorites! Nice Pics by the way. My mouth started to water while I was looking at the burger.